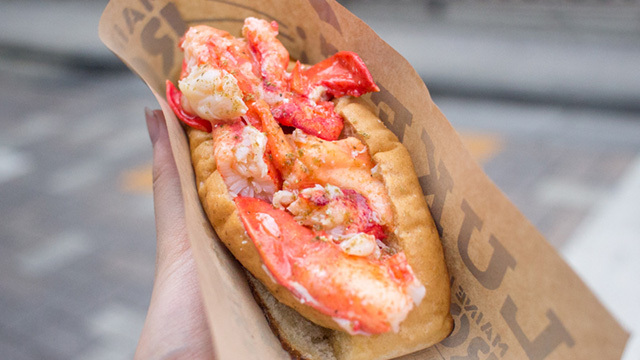 For your summer of 2016 & beyond enjoyment, my list of the best 9 ½ Lobster Rolls. A quick stroll from the Lenox brings you to Atlantic Fish where their street front patio or air conditioned dining room both serve as perfect backdrops for their fabulous fresh fish selection! 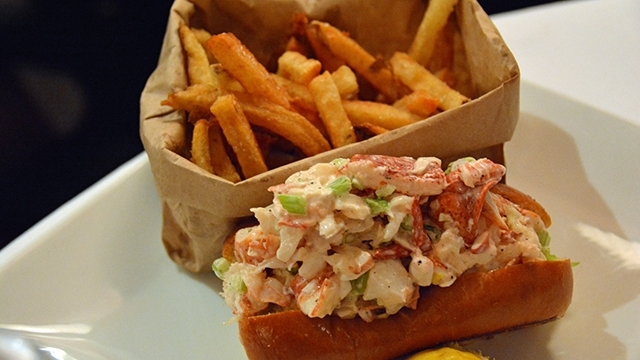 Afish’s lobster roll, brimming with sweet meat in a perfectly toasted roll, is accompanied by its own adorable brown paper bag of hot fries-upgrade to the sweet potato fries-they’re totally worth it. Begin with their unique sea bass chowder full of flavor and a bit lighter than the traditional clam and perhaps a generous cocktail or a lovely glass of rose-summer doesn’t get any better! 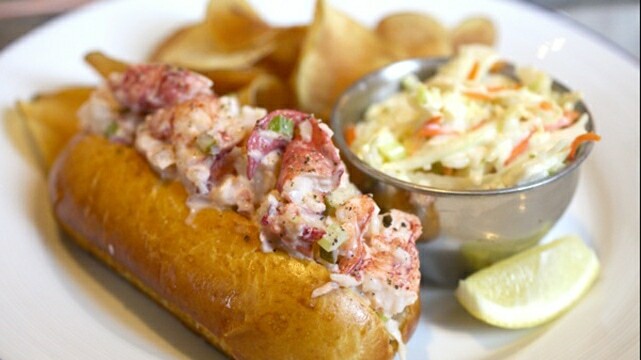 Journey to famed Chef Barbara Lynch’s oyster oasis for a lobster roll made even more perfect with the addition of bacon. The B&G Lobster BLT is the perfect marriage of lightly dressed fresh lobster, crisp bacon, fresh lettuce and farm ripe tomatoes accompanied by tasty fries and bread & butter pickles. A few oysters to begin, accompanied by a crisp white wine-let your server choose-you’ll be in heaven. Off street summer patio seating is a bonus! What’s a summer day in Boston without a trip to the Waterfront? Head on down to James Hook after a great morning spent exploring the new exhibits at the Aquarium or before a tour of the new Seaport area. This no frills, fish market setting is popular all year round. Hook’s lobster roll is a purist-big chunks of lobster, mayo & celery-that’s all and that’s all that it takes to make this lobster roll the perfect lunch. Two sizes are available-choose the large-totally worth the splurge! Creamy traditional clam chowder makes a great accompaniment. 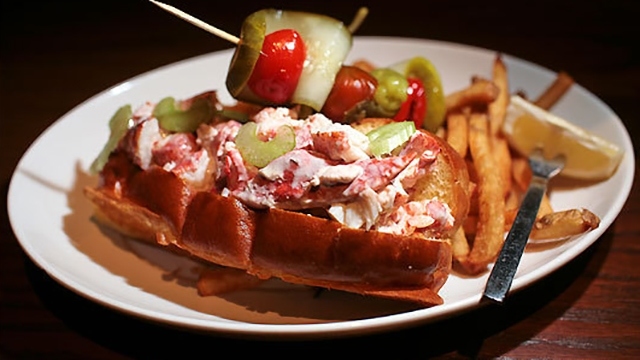 So you’re heading to Fenway to take in a Sox game and the lure of ball park food, grilled sausages with peppers and onions & Fenway franks are the stuff of Boston legend, is not appealing-Island Creek Oyster Bar offers a great alternative. Their fried oyster slider is the only competition to their elegant rosemary brioche cloaked lobster roll. ICOB is also an excellent brunch option with one of their artisan drinks or a Bloody! Shout out to ICOB lil’ sis (the ½ of the 9 ½ list) Row 34 in the Seaport. 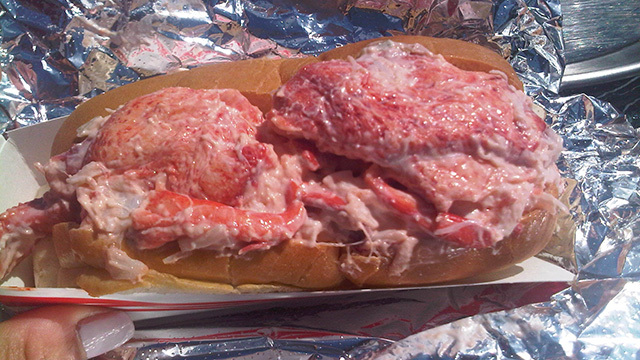 Row’s warm buttered lobster roll & butterscotch pudding make it a winner! Located directly next door to the Lenox, Luke’s is a great neighbor serving a delicious product. The lightly dressed and specially spiced lobster roll is a hit but my recommendation is the Noah’s Ark-a sampling of 3 half rolls of shrimp, crab and lobster salad-it will be hard to choose your favorite. We also love Luke’s commitment to sustainability; “Buying directly from the lobstermen, we can trace the lobster’s exact origin back to the very dock it came from.” Great location, delicious assortment of fresh seafood delights and eco-friendly –win/win for all! No reservations, always a line and still recommended? Yup that perfectly describes the extra tiny Neptune Oyster, located in the heart of the very Italian North End! Give your name to the friendly hostess and she will call you when it’s time for your lobster adventure. Squeeze into your table or seat at the bar, choose a few perfectly chilled oysters or the fabulous cilantro lime infused mussels, while waiting for your lobster roll. 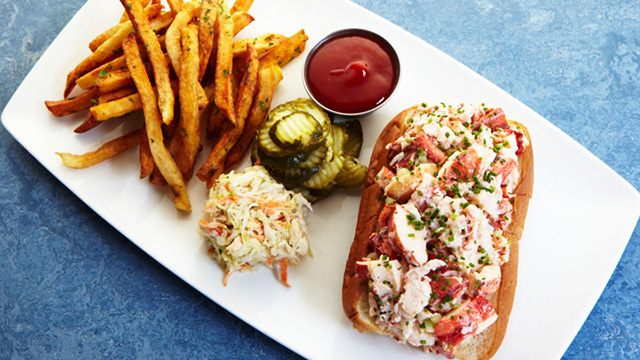 Neptune’s hot buttered–perfectly cooked -lobster roll spills out of its griddled brioche bun almost on top of the homemade crispy-salty fries causing heads to turn as it arrives at your table. Chilled mayo option available as well, but the hot butter is the roll of Boston dreams. Excellent, well priced wine list makes it a wonderful dinner choice or the perfect lunch spot NOT to return to the office from. Does farm to table speak to you? Post 390 is all about local and its creative and seasonally changing menu reflects that philosophy. Chilled Scituate lobster takes center stage in either the griddled brioche roll or a delightfully refreshing lobster salad plate. For the burger inclined, Post features all natural Painted Hills beef topped with Vermont cheddar served with all the fixings. Great two level setting, a wonderful fireplace for those rainy July days, and a friendly knowledgeable bar team make Post a terrific “local” lobster experience! Summer shopping on Newbury St is not complete without a patio stop. Justifiably famous as the place to be “seen” in Boston, the patio at Stephanie’s is a welcome respite in the middle of Back Bay. 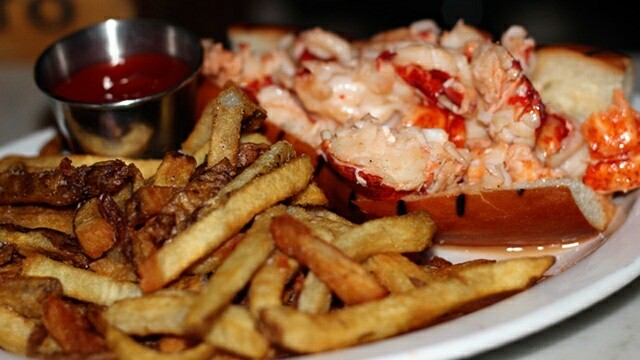 Stephanie’s on Newbury serves a wonderful lobster roll in the classic New England tradition; fresh lobster meat, served on a house baked brioche roll-overstuffed with lobster goodness! Like all of the food at Stephanie’s, it’s a huge portion, perfectly accompanied by tasty fries or mixed greens. Order a refreshing, fresh squeezed grapefruit greyhound, savor your lobster roll, enjoy the delightful sun filled patio-living the Boston life! 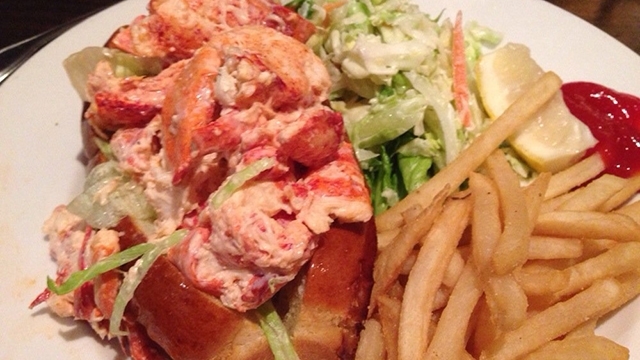 The seaport district-it’s very name screams lobster roll excellence! While taking in the sights and sounds of Boston’s Innovation/Seaport District stop in for a quick lunch at this unassuming fresh fish spot. 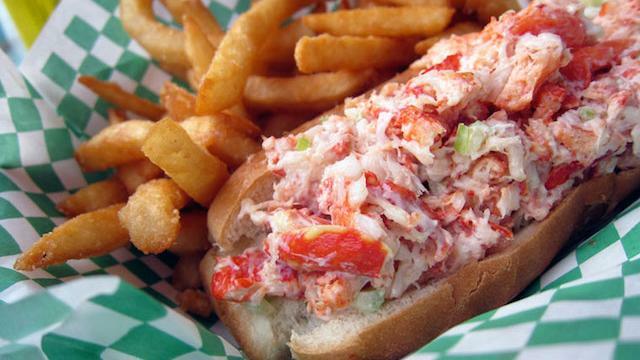 Simply fresh, well prepared lobster rolls and crispy fried fish & chips attract the visitors and the locals. Grab a soda (or a tonic as we like to call it) and enjoy a tasty lunch with the locals!